Searching through the dark forests of the realm, Jestro finds The Book of Fear. It's pretty scary. But he feeds it to the book of Book of Monsters, and he uses it to call forth the Whipperella, a monster that can induce fear. One-by-one she uses her knightmarish power on the knights and they experience their own worst fears. Clay fears not living up to the Knights' Code. Lance fears being a nobody. Macy fears never being a knight and Axl fears having no food. Aaron must take the lead because he's fearless; he does everything with reckless abandon. It's not until he leads the group out of the forest - as they fight off the Whipperella - that they we find out Aaron's true fear - the fear of peace and quiet and no more challenges or high energy escapades. It is final graduation fighting exams for the latest Knights from Knights' Academy. All our new Knights demonstrate their prowess: Clay, Aaron, Alex and Lance. Princess Macy gets to join them, but her father doesn't want her to graduate. As part of the entertainment, Merlok does an amazing magic trick. His act is followed by Jestro, the King's Jester. He's terrible and everyone laughs because he's a real joke. While Jestro roams the halls of the King's Castle, forlorn, he hears the Book of Monsters calling to him from Merlok's library. The book talks Jestro into gathering as many books of spells as he can carry, but they're interrupted by Clay! As Jestro quickly pages through the Book of Monsters to attack Clay, Merlok arrives. There's a battle in the library between Jestro and Merlok. Finally, the wizard summons up his most powerful spell in self-defense. Boom! There's a big explosion and when Clay forces his way back into the library, Merlok, Jestro and the magic books are gone! When Jestro awakens, he's been blasted miles and miles away from the King's Castle by Merlok's explosive spell. And, it seems, all the books he was trying to steal have been scattered, too. The Book of Monsters broke Jestro's fall and now he can use the book to attack the people who laughed at him. Meanwhile, the King and his newly-trained Knights pick through the rubble of Merlok's library. They'll have to figure something out because Jestro and his newly made magic monsters attack King's Castle! Clay organizes the Knights to defend the kingdom. It takes all their training, plus the help of an old friend...MERLOK! Only now he's MERLOK 2.0. Ava has been piecing together what happened and discovering that the ghost in the machine she's been chasing is really Merlok in digital form. Now, he can use his magic digitally and he downloads just the right weapons to the struggling Knights! They finally foil Jestro's attack with Merlok's help and officially become NEXO KNIGHTS! 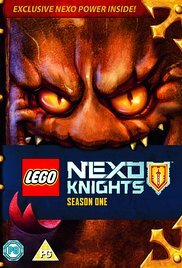 Now the NEXO-Knights get rolling in The Fortrex, their own Rolling Castle! This great new headquarters which houses Merlok 2.0 as an operating system, will be how the knights move around Knightonia and protect it from Jestro and his monsters. Speaking of the evil jester, Jestro uses some newly-made monsters to attack a town far from the capitol where he thinks he's safe from the Knights' reach. We see two parallel stories here: the Knights training, learning more about digital magic and getting organized as a team and at the same time we see Jestro making monsters, trying to learn how his powers work and talking to the Book. In the end, the Knights roll up in their castle and defeat Jestro and his marauding monsters. Jestro finds the Book of Chaos in the countryside and decides he must feed it to the Book. The Book of Monsters actually tells Jestro not to feed it to him; he tells Jestro he's not ready for that kind of power. But Jestro doesn't listen. Now the Book unleashes chaotic monsters and Jestro uses them to attack the King and his party who are on a business-related tour of the kingdom. 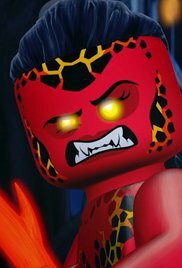 When the NEXO-Knights show up to stop the monster attacks and realize that they must save King and Queen Halbert - Macy's parents - from the chaotic evil monsters that have been unleashed. Clay asserts himself as leader and brings order to the knights from the chaos. He has his own book: the Book of the Knight's Code. They should all live by it. Lance agrees to star in a movie about remake of a classic film in Knighton: The Golden Castle. 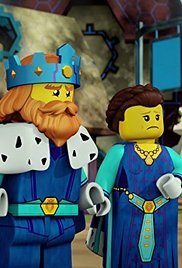 While pillaging a village, Jestro and the Book of Monsters see a movie poster for The Golden Castle and the book says the legendary Golden Castle is filled with riches! Jestro explains that it's just a dumb movie and that it's not real. The Book, who's been shelved for many years, wants to eat the movie script to learn more about the modern world. 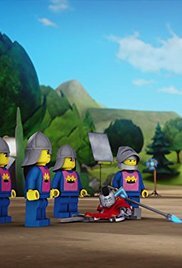 On the set of the movie, Lance has invited the other Knights to act as extras. When they see how Lance is being portrayed, they're incensed. When Jestro attacks the movie set to get the script for his book to eat, the film director keeps rolling. This battle footage is fantastic! The Knights defeat Jestro even though the movie set is trashed. The director will make it work. At the premier of the movie, Lance is embarrassed to see that he's been reduced to comic relief for the realm's bravest Knight...Macy! The director has now made her a star. 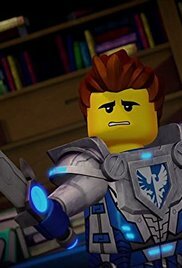 Jestro, happy he has the real Book of Deception, uses it to create bad versions of the NEXO-Knights. The fake knights then attack villages and hamlets. 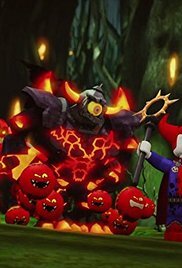 When the real NEXO-Knights arrive, they're booed and pelted with food. Why does everyone hate them? To make matters more confusing, a giant Mech Suit in black - The Black Knight - appears to defend the kingdom's villages from the fake knights. The Black Knight ends up being very powerful and throws Jestro and his fake knights for a loop. He's cool and mysterious. 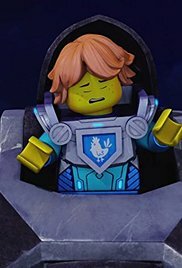 But when the fake Knights get the better of him, the real NEXO-Knights appear to fend them off and learn their deceptive secret. The Knights save the Black Knight and they open him up to find young Robin! He used a deep, deceptive voice! The Knights realize that Robin has potential but also still has some learning to do. In a dark, destroyed part of the kingdom, Jestro arrives at the ruins of a huge castle. The Book of Monsters knows this place, as the great evil wizard Monstrux lived here. The Book sniffs out some powerful magic in the ruins: The Book of Destruction. 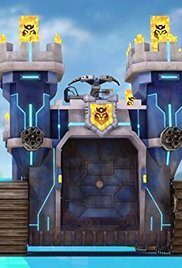 With this, The Book tells Jestro they can destroy the NEXO-Knights and then attack the King's Castle and cause massive destruction. Jestro creates destructive monsters and sends them all over the realm, so the Knights must separate and fight single combats all over the place. They Knights lose these battles and learn that they must work as a team! And, just when the Knights are scattered across the Kingdom, Jestro attacks the King's Castle! It looks like all is lost. When Aaron, who has escaped, returns to see Jestro' attack, he realizes he must gather his fellow Knights. Merlok says it's very dangerous, but Aaron says he must take the risk to gather the Knights and save Knighton.